Wee Lil' Blog: The Sanitize Cycle? The diapers are a different story though. For starters, I'm the only one that does the diaper laundry. Maybe that's because no one else WILL wash it. Maybe it's because I don't trust anyone else to do it right. One thing I do know, though, is that there IS a right way and wrong way to wash your diapers. First, be sure to use the right amount of detergent. Too much or too little is a problem. It can lead to diapers that aren't really clean or, on the other side of things, cause build-up from all the detergent. 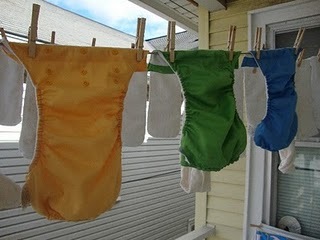 My last tip on washing your diapers is rinse, rinse, and rinse some more. You want the bubbles to be gone to ensure the detergent is thoroughly washed out. Part of this is not using too detergent as previously mentioned, but much of it depends on lots of rinses. Have a great Veteran's Day! Thank you to all our troops, both past and present, for all you've done and continue to do for our country!